This is a funny experiment! Let’s see if we can make some funny faces. What happens when you stop sucking on the straw? The marshmallow is not a solid object. It has many air pockets like a sponge. 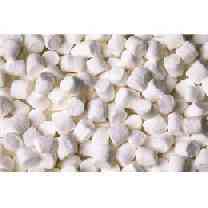 By sucking the air out of the jar you decrease the pressure inside the jar which causes the marshmallow to decrease in size, becoming a solid. When you release the straw from your mouth the air rushes back into the marshmallow allowing it to return to its normal size.